The Dreamliner is the newest generation airliner from Boeing. Made mostly of lightweight materials and with very fuel efficient engines, it is designed to (and apparently really does) use 20 per cent less fuel than planes of comparable size. 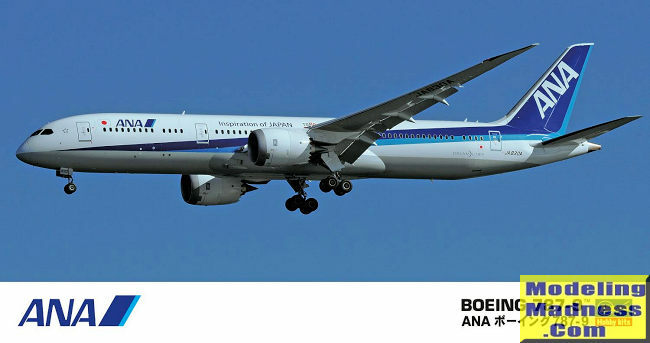 The 787-8 entered into service with All Nippon Airlines (ANA) as the launch customer in late 2011. This version, the 787-9, is bigger and first flew in commercial service in 2014, with Air New Zealand and ANA. The new 787-10 just rolled out this year and should enter airline service in 2018. I've flown on both versions - the 787-9 with ANA and the 787-8 with Hainan Airlines (long haul China-US); my wife has flown them long haul with Xiamen Airlines too. For the passenger, the experience is superior to earlier airliners (well, flying ANA, Hainan or Xiamen is already a big headstart over the likes of American, United, Delta, or even Air China, even on those airlines' Dreamliners). The windows are bigger, there's a little less noise, the air is a bit fresher and not so dry thanks to better air conditioning design, and of course the planes are still brand new. The 787-9 depicted by this kit has different configurations depending on whether ANA uses them for domestic (rampacked like a sardine tin with 395 people) or international (215 to 246 in mixed class setup). That's roughly comparable to the ANA 777-300ER (212 to 264 in mixed class setup). The 787-9 has a nominal range of 14,000 km, while the 777-300ER can manage about 13,000km (those numbers are just nominal, depending on seating, cargo and passenger loads, and the particular route). The plane had some development problems, notably with batteries causing fires, but these appear to have been ironed out. Don't worry, you won't have to suffer the indignity of US carriers to experience the Dreamliner. There are plenty of fantastic Asian and Middle Eastern airlines to fly, with much better cabin service than you'll find on any North American airline (on which, let's face it, if you don't get arrested or publicly demeaned, you should consider yourself lucky). ANA and JAL are a great start; try Hainan and Xiamen for Chinese airlines done right, and Etihad is reliably good too. 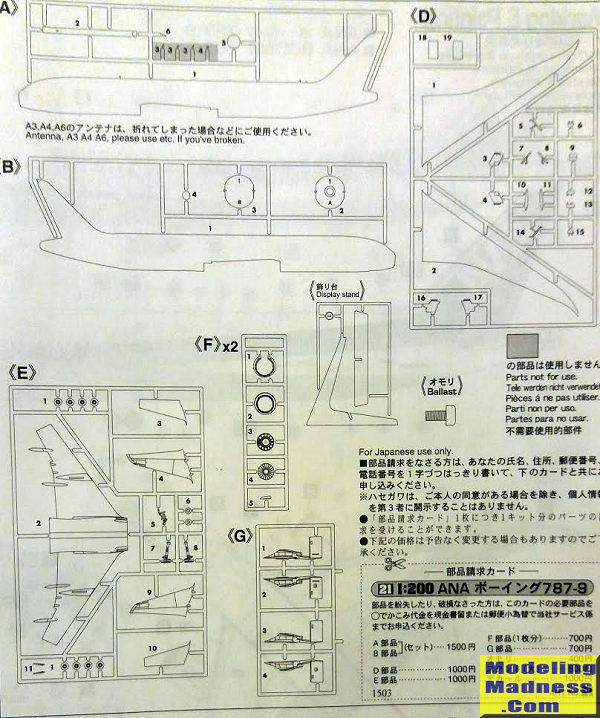 This is a new one from Hasegawa, and there is a presumably very similar 787-8 kit also in ANA markings. It's quite simple, and unlike the earlier 777 kits, it has no cockpit windows anymore. The whole fuselage is solid and decals provide all the windows. The fuselage has two internal bulkheads, one with a hole to insert the metal screw you'll find in the box. That should do for nose weight though to be sure, I'll add a little extra. The majority of the parts are for the undercarriage and the twin engines. These are really nicely thought out, with a single piece for the majority of the engine casing, avoiding the need to clean up seams. The surface of the plastic is fairly nice, though mine had a very few faint blemishes which will probably want a swipe with some fine sandpaper. 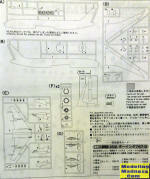 Panel lines are discretely engraved consistent with the latest Hasegawa kits. The kit includes a stand. The decals are great and nicely depict ANA's attractive blue scheme. The 787-9 famously wore a Star Wars scheme, and I actually flew on that one Tokyo to Beijing. As we boarded, a big Yoda doll sat in the cabin crew's jump seat. Everyone was given a little plastic R2-D2 card to commemorate the journey. You can get this decal sheet from the aftermarket - google around a bit. Perhaps one day Hasegawa will do it as a limited edition, but I imagine the royalties or licensing fees will be expensive. Anyway, these decals look good too. 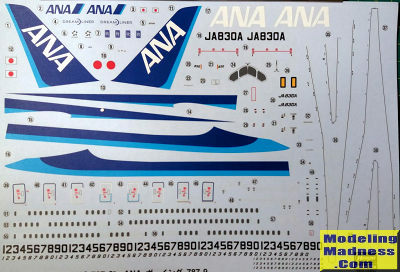 If you don't like the ANA scheme, Hasegawa 10722 has the -9 flown by JAL, or you can get a some 787-9 decals from the aftermarket. a search offers up a few options.